Women's Refined Slim Fit Back Strap Rain Boots is rated 4.2 out of 5 by 48. Version plus ajustée des emblématiques bottes Original, dont les éléments principaux ont été revus pour créer une silhouette affinée. La botte Wellington originale affinée à bretelles arrière présente un dos contrastant enveloppé d'une sangle et d'une boucle, tandis que la semelle a été moulée pour une apparence plus classique. Rated 5 out of 5 by Canada1 from Great look! I received my boots a couple of weeks ago and I love them! They are slim fitting which I love and the back buckle adds a bit of detail on an otherwise simple clean look. I choose my regular shoe size and they fit great. I wish the warm weather wasn’t coming so soon so I could wear these more often! Rated 5 out of 5 by Toubibmom from Wonderful boots It looks so dashing that my 2 years old lifts his leg very high to try them on. 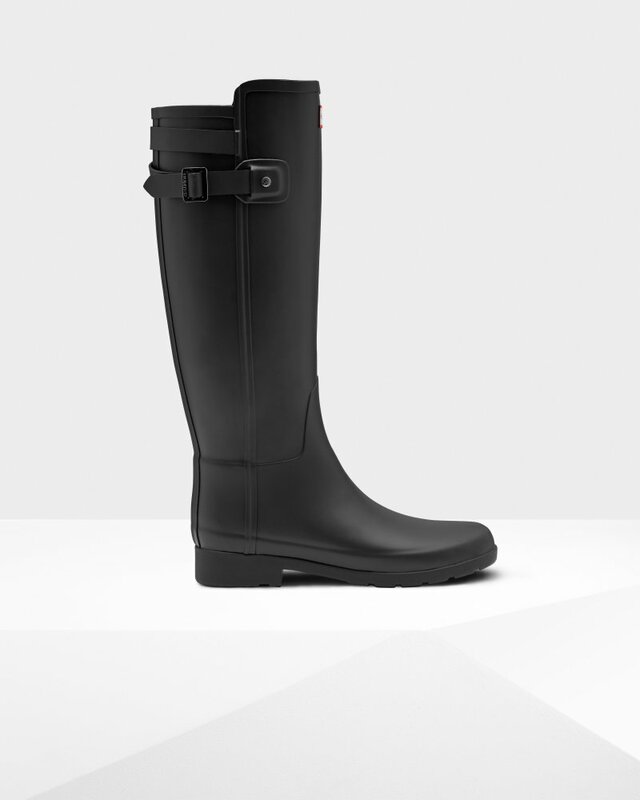 It is the best rain boots ever, being practical and fashionable at the same time! Rated 5 out of 5 by Vivian from Perfect! I bouger thème 3 week-end agi and they are exactly whatever I needed : style and comfort. Rated 3 out of 5 by Allyally29 from Not for high arches or off-roading These look great, but they were too fittedin the foot for someone with high arches. Every time I took a step, they pinched the top of my foot. I exchanged them for a pair of original fit boots. As well, they look very sleek and elegant, but I plan on “off-roading” in the boots, so the original style is a better choice. No problem, the customer service at Hunter is great and it was easy to exchange them. Rated 5 out of 5 by Nurgis from Sleek and non slip Love my new boots it fits perfectly and looks great! Rated 5 out of 5 by Breanne from Love them! Very happy with these boots. I will definitely purchase more items in the future.